MSF increased its activities in the north of the country to provide emergency care for victims of violence. Formed by the unification of former British and French colonies, the modern West African state of Cameroon was created in 1961. Home to nearly 24 million people, the country has one of the highest literacy rates in Africa and is often referred to as "Africa in miniature" due to its geological and cultural diversity. Médecins Sans Frontières/Doctors Without Borders (MSF) first worked in Cameroon in 1984. Our work in the country has focused on responding to endemic and epidemic diseases and caring for displaced people. In recent years, the mainly-Muslim far north of the country has been drawn into the regional Islamist insurgency of terror group Boko Haram. By the end of the 2017, there were around 88,000 refugees and 240,000 internally displaced people in Cameroon. Since 2011, the conflict between armed opposition groups and the Nigerian army has forced hundreds of thousands of people from northeast Nigeria to seek refuge in Cameroon, Chad and Niger. During the past three years, violence has increasingly spilled over from Nigeria into the three neighbouring countries, causing further displacement. By the end of the year, there were around 88,000 refugees and 240,000 internally displaced people in Cameroon. Nigerian refugee child who arrived in Minawao refugee camp. 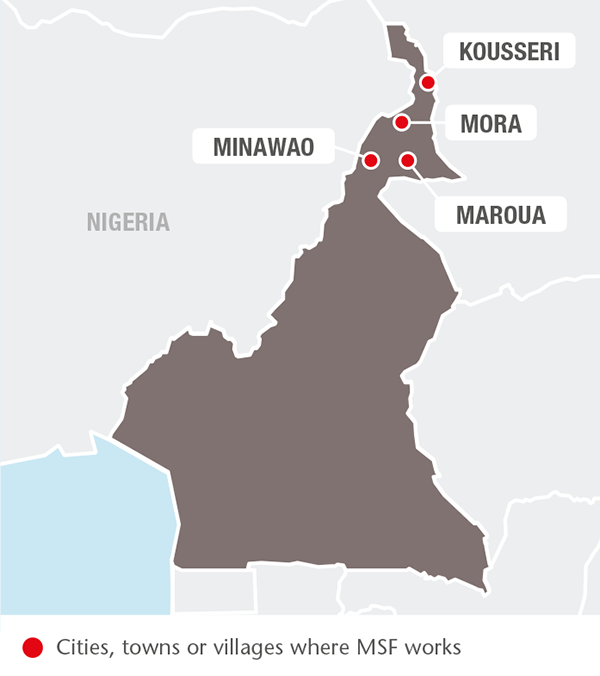 Since the first suicide attacks on Cameroonian soil in Maroua in 2015, there have been frequent bombings in the Far North region. In 2017 alone, MSF recorded over 58 such attacks in the region – more than one each week. In response, MSF scaled up its emergency surgical activities and boosted its capacity to treat mass casualties following attacks. In the town of Mora, close to the Nigerian border, MSF rehabilitated the operating theatre and set up an ambulance referral service at the local hospital. The team stabilised patients and transferred those in need of specialised surgical care to Maroua hospital. In 2016, MSF rehabilitated the operating theatre and post-operative ward at Maroua hospital and now manages its surgical department. During 2017, MSF teams carried out 3,136 surgical interventions in Maroua. MSF also trained Ministry of Health staff in the management of large influxes of wounded patients and donated mass casualty kits to local hospitals. Displacement and violence have put a further strain on the already weak and overstretched health system. In the area bordering Nigeria, health facilities lack staff and medical supplies and many have been abandoned altogether. In response, MSF provided medical care in several locations in the north of the country. Mirjam Markwalder with children outside the intensive therapeutic feeding center in Batouri. 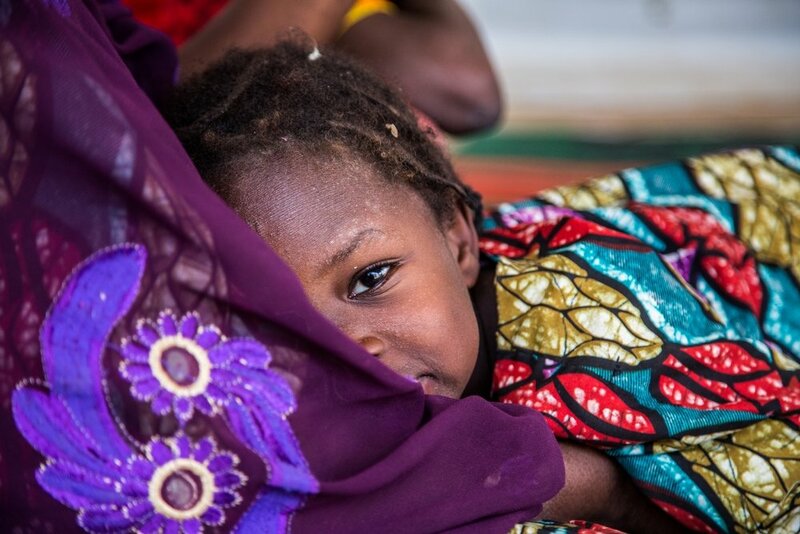 In hospitals in the towns of Mora, Maroua and Kousséri, teams ran specialised nutrition and paediatric care programmes for children under the age of five. MSF also supported surgery and set up a blood bank at Kousséri district hospital. In addition, MSF staff worked in two health centres serving displaced people and local residents in Mora, and offered nutritional care and outpatient consultations in three health centres on the outskirts of Kousséri. 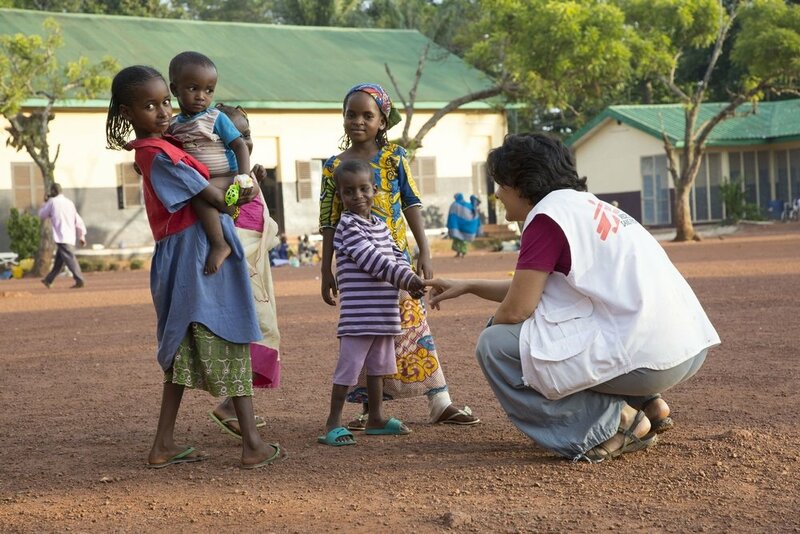 In July, MSF handed over its medical activities in Minawao refugee camp, which is administered by the UN refugee agency, to the International Medical Corps. MSF teams had been providing maternity services and nutritional and psychological support to Nigerian refugees in the camp. More than 110,000 outpatient consultations were carried out since the project started in 2015. 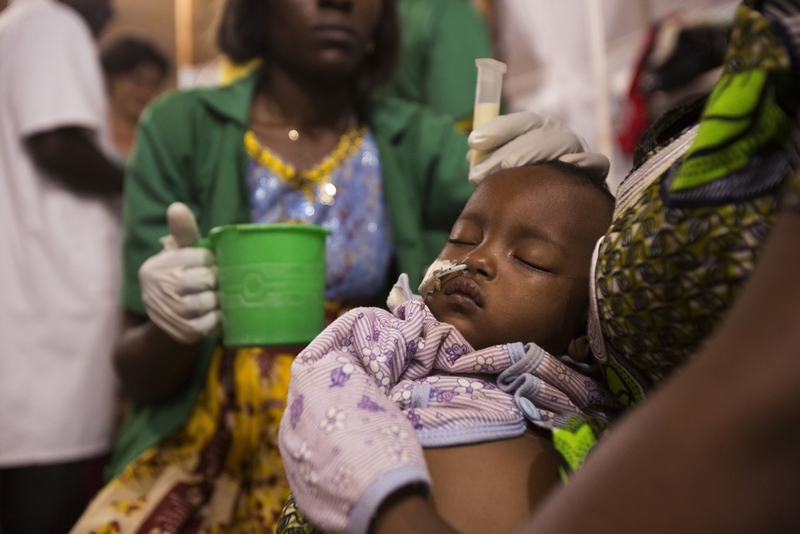 A child is given a gastric nasal tube to help her feed in the ITFC of the district hospital of Batouri.